We all know summer is the perfect time to dig into a good book! Local libraries and big name bookstores have already posted their lists of kids’ summer must reads and are actively promoting participation in their summer reading programs. Though such lists may contain good titles, don’t allow them to limit your child’s summer reading selections. 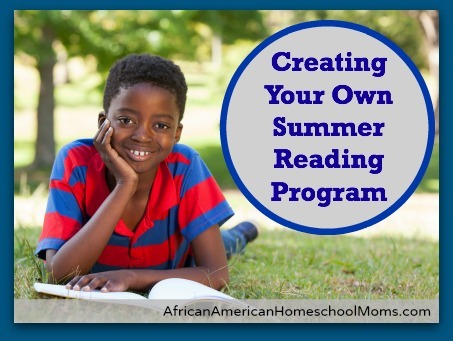 And though sponsored summer reading programs are terrific, you can easily create your very own summer reading program to meet your child’s needs. Creating your own summer reading program has several benefits. First, it gives you the opportunity to create reading lists full of the works of Black authors and Black illustrators you want your child to know. Next, it allows you to introduce your child to various genres of literature. Finally, creating your own summer reading program lets you create a rewards system based on your child’s specific interests. Here are some steps you can take to plan a personalized summer reading program. I’ve also included a few free printables you can use to organize your program and make it fun! 1. Determine a time frame. Our Summer Reading Program begins on June 1 and ends on August 31, but you should set a time frame that works best for your family. 2. Choose books from a variety of genres. Popular genres of literature include biography, poetry, historical fiction, myths, realistic fiction, comedy, science fiction, and mystery. Don’t allow your child to fall into the habit of reading the same type of books all the time. Instead, select titles from various genres. For example, if you have a science fiction buff, cross genres by encouraging her to read the biography of a scientist as well. 3. Add titles to the Summer Reading Planning Sheet. Determine the genre and type of books (picture books, graphic novels, chapter books, novels, etc) you’d like your child to read. Then, talk to your child about the types of books he’d like to read. If you wish, ask friends or relatives to recommend selections as well. Compile a list of books and write the titles, authors, and genres on the Summer Reading Planning Sheet. 4. Read and keep track of books. Have your child read daily for at least thirty minutes. More is better! Each time your child completes a book, have him or her write the title of the book on the Been There, Read That Log Sheet. At the end of August, it’ll be fun for you and your child to look back and see how much was read during the summer. 5. Encourage your child to read in a variety of places. You don’t want summer reading to become boring, so encourage your child to read in a variety of different places. My free Reading Everywhere Challenge Sheet gives children a selection of 46 different places for them to read. That’s a different reading place for every other day from June 1 to August 31! You know what makes your child happy. Reward your child’s accomplishments with a Summer Reading Success Coupon. You can base rewards on how much time your child reads, but also consider giving rewards for every book finished, listening to an audio book, or reading a book to a younger sibling. Just print it out the Summer Reading Success Coupons and write your special reward side the box. I am happy to offer these free printables to you. However, I expect you to be respectful of my work by downloading my files for personal use only. Do not steal my work by claiming my files as your own. Do not sell my files. Do not edit my files or share them with anyone else. (This includes posting my files on websites, in groups, and in forums.) Do not link directly to my PDF files, but instead direct people to this post, so they too may download these free files. I thank you for your honesty and cooperation. I love this and I especially love the challenge page..We are going to have fun with this..I picked up some reading reward certificates from Dollar Tree at the beginning of the year..So Now I think after Summer we may have a Fall, Winter and Spring Reading Challenge as well.. Thanks so MUCH for these wonderful ideas! We are excited for summer, and reading is a HUGE part of it! I love all of your ideas! You’re welcome Nicole. I hope you all have a ton of fun reading lots of great books. Enjoy the summer!